It’s Gujarat’s one of the oldest Lord Ganesh temples and the only one made completely out of wood. This is the 168 Years Old Dhundiraj Ganpati Mandir, located in Wadi area. 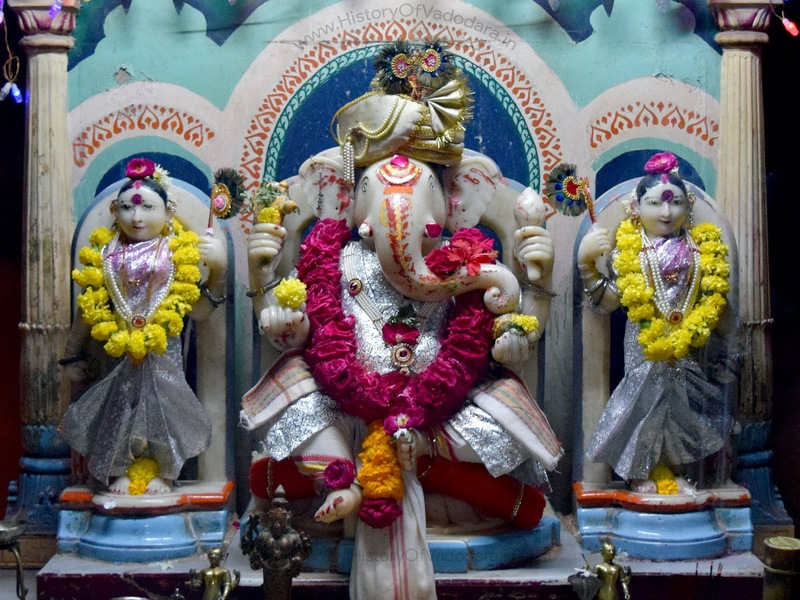 This temple is unique as the marble idol of Lord Ganesha is placed with idols of his wives Riddhi and Siddhi and their children Labh and Laksh. The ‘moushaq’ which is generally at the feet of Lord Ganesh is placed in this temple on marble pedestal outside the temple. The Temple was built by Shri Gopalrao Mairal in Year 1905. The temple is for Hindu and Gaanpatya community. The temple is built of stones, bricks and wood, and the mouse (mushak of God) is built of Aaras. The temple is 2 storey. The temple also small Park which has small fountain inside. An ancient Sanskrit manuscript which was translated at the MSU department of Sanskrit, Pali and Prakrit has revealed details of a 157 Years Old temple of Vadodara, its history and the other information about the erstwhile Baroda state. The temple exists even today and reveals a unique blend of architectural styles. The manuscript titled ‘Ganesha Tosini’ and dated 1870 AD, was written by Kashikar Prabhakar who was resident of Varanasi and had visited the erstwhile Baroda state in 1870. Department of Sanskrit, Pali and Prakrit head Uma Deshpande said the manuscript was given to her by seventh generation descendants of Gopalarava Mairal, who was Sardar in the erstwhile Baroda State during the time of Maharaja Khanderao Gaekwad. The manuscript gives details about Vatapattana (as the city was called then) and the erstwhile Maharaja Khanderao Gaekwad. It reveals that Mairal commissioned the construction of the temple 157 years ago. He was a wealthy Sardar of the Baroda State, and even gave loans to Mahraja Sayajirao Gaekwad II to meet expenditure of the latter’s son. The temple has withstood 157 years and stands in the old city area in Wadi Rangmahal. It is called Dhundiraj Ganpati temple of the Mairals. It is unique as it displays a unique architectural style. In the past many students of the department of architecture have come to the temple for study and sketches. The manuscript also describes the temple as a ‘superb shrine’ built within a palatial building.The carvings on its wooden pillars are a must-watch apart from the fountain kept right in the front of lord’s idol. there is an identical ganesh temple in khanderao market kacchawadi.. in vadodara of nageshwar alias ganapati buwa .. karmarkar… this temple is worthseeing and a copy of the above temple on a smaller scale..